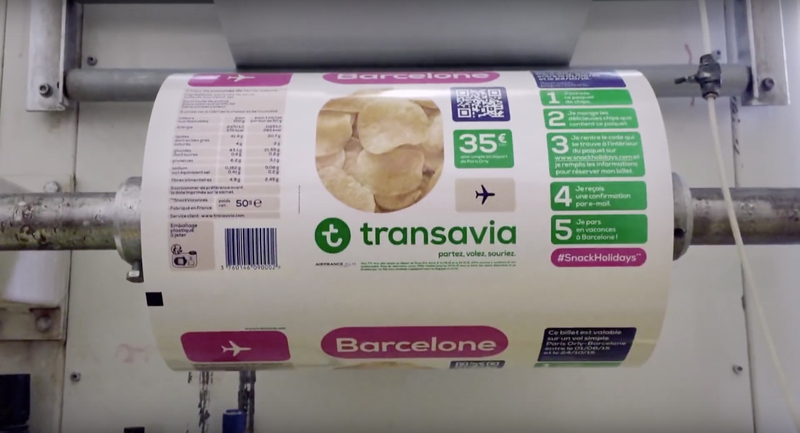 Transavia Snack Holidays campaign from France has won the Grand Prix for Direct at Eurobest, following on from the two Gold Clio Awards won in the previous month. Transavia, Air France KLM’s low cost company, produced consumer products, chips, sweets, cereal bars, chocolate bars and soda drinks, to increase access to holiday fares. Exclusive partnerships were developed with Carrefour Group (N°1 European mass distributor), Selecta (N°1 vending machine brand in France) and MK2 cinemas. The campaign, launched in April 2015, included digital and classic billboards placed along consumer’s path towards sale points on underground platforms and in shopping centres. Purchasers could buy tickets to Lisbon, Dublin or Barcelona for around €35 and €40. The Transavia Snack Holidays campaign was developed at Les Gaulois, Paris, by chief creative officer Gilbert Scher, executive creative directors Luca Cinquepalmi and Marco Venturelli, art director Julien Doucet, copywriter Lilian Moine, managing director Elisabeth Billiemaz, account manager Aurore Cornen, marketing managers Stephanie Pigaglio and Lisa Donnadieu, head of TV Christopher Thierry, TV producer Sarah Bouadjera, heads of digital Guillaume Lizard and Olivier Tewfik, digital project managers Romain Cialdella and Sandrine Lafont. Filming was shot by director Julien Bouvet via Hercule with production manager Maxime Bouyer, sound producer Benoit Dunaigre, art director Tristan Lecuyer, editor Pierre Laisne. Media was handled at KR Media.